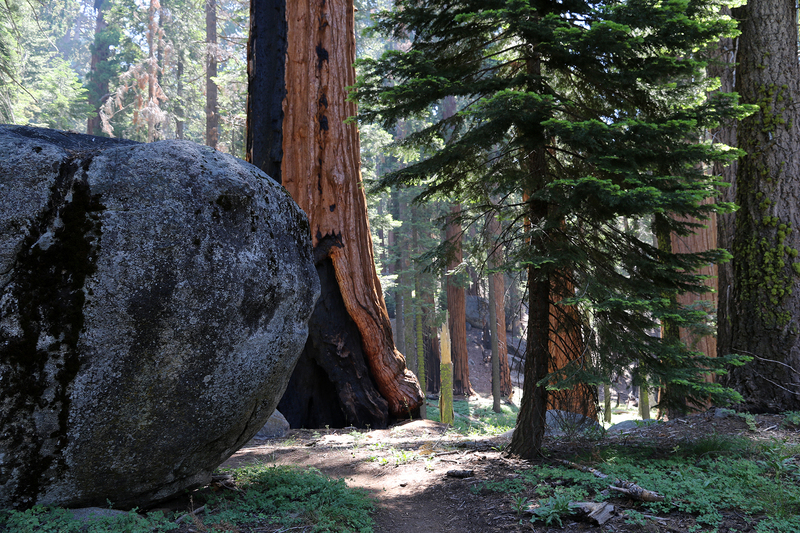 The Parks were Sequoia and Kings Canyon in the southern Sierra Nevada. We’d already been to Joshua Tree, Channel Islands, Yosemite, and Pinnacles in California, so the other two Sierra Nevada National Parks had not really been on my radar for anytime soon. I was slightly hesitant to go two a couple of really famous Parks over a holiday, but really as soon as Sean suggested it, I was game. In January we worked with my parents and my best friend for thirty-two years, Andy, and his partner, Terry, to to find an AirB&B in San Diego to share over the wedding weekend. We arranged with Charlie and Kevin to visit them the weekend before the holiday, and we decided to spend the middle of the week in the mountains of California. It turned out to be a really nice beat for a vacation: three nights in LA, three nights in the mountains, and three nights in San Diego. Because of the wedding, we decided not to camp and have to bring our gear. I found a cabin AirB&B in Three Rivers, California, the gateway town to Sequoia National Park. We’d arrive on Monday afternoon, spend Tuesday in Sequoia and Wednesday (July 4) in Kings Canyon, and head down to San Diego on Thursday. I even went so far as to book the shuttle from Three Rivers in and out of Sequoia. It felt odd not to be camping, but it also was kind of a lark to experience National Parks a bit differently. In fact, experiencing the Parks in a variety of ways had always been a goal of this adventure. With Charlie and Kevin in Los Angeles until Monday. With Mother and Dad and Andy and Terry until Sunday. This entry was posted in Journey and tagged California, Kings Canyon, Sequoia on July 22, 2018 by Brandon Hayes. can’t wait to hear abut the trip. Thank you! I can’t wait to share the stories.